A few years ago I learned how to clone grape vines, with the intention of growing table grapes, and maybe someday making wine as a side project. Soon after, I began accumulating more and more varieties of grapes, including Concord, Thompson, White Niagara, Canadice, Blue Concord, Reliance, Niagara, Beta, Stueben, and a few unnamed varieties that had favorable crops. While dad was still around, I made my first few bottles of “wine”, which I’m sure any person who has ever sipped wine would call gross, but it fermented, and more importantly, dad got to try it. We all agreed that the product of my experiment had a use, but flavor was not the reason you would drink it. I decided again that someday I would make more wine and take the subject more seriously. 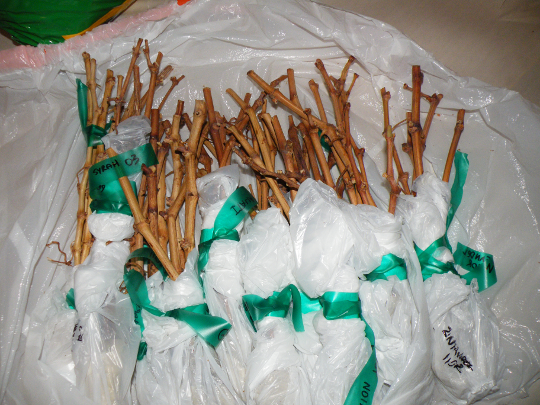 A week or so ago, I got an email from Matt, offering me some cuttings from some of his collection of wine grapes. I promply offered to take any cuttings available as I’m always expanding my collection. 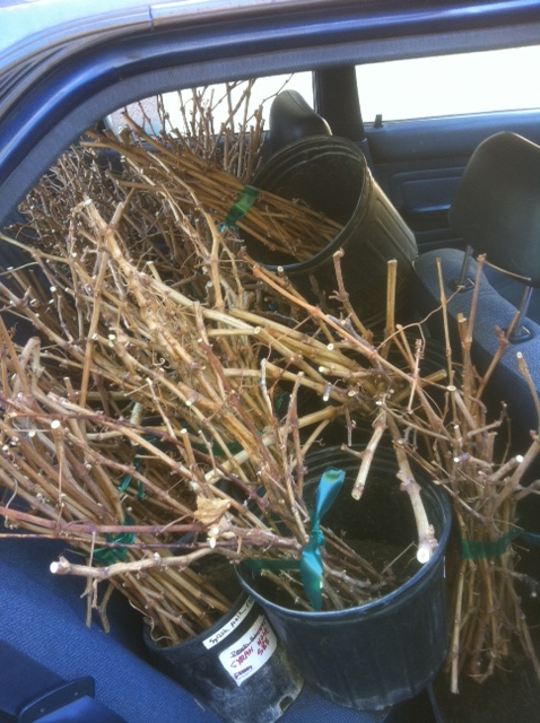 From these cuttings, I could then grow my own grape vines, and if they grow well in NW Pennslyvania, create my own wine. 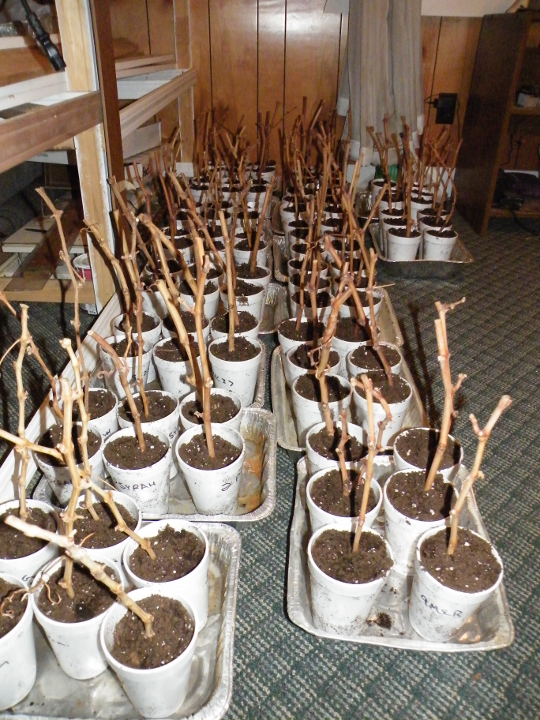 A few days later I got 2 pictures from Matt showing all of the cuttings from his vinyard, and I was quite impressed. The cuttings filled the back seat and trunk of his car, and I could tell a good deal of work had gone into this project. The email also included a FedEx tracking number for the box which had originated on the west coast. Once I had the tracking number I realized I had better get some preparations done on my end. I purchased a 2.5 cubit foot bag of Miracle Gro Potting soil, and a large bag full of styrofoam cups. I located lot’s of aluminum baking pans which would hold the cups, and cleaned them out. Another day or two passed by, and I recieved two boxes in the mail, packed with lots of cuttings. When I opened the box and looked at the cuttings I felt overjoyed, even a bit overwhelmed with the gift I had been given. The cuttings had a unique smell, and coloring, something I think reflects the enviroment they were grown in, with far more sun than the vines I usually see. It’s almost as if I could see the sun’s bleaching effect on the vines, and smell the air in which they had grown. 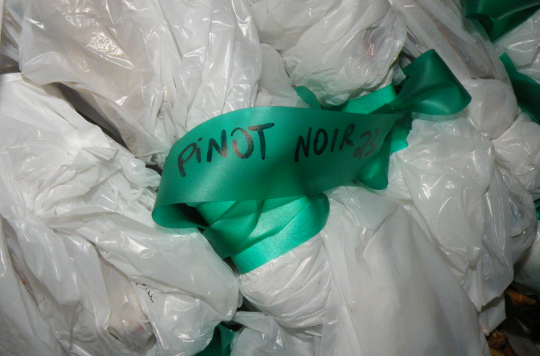 Each variant was carefully covered in wet tissue on the base of the cuttings, wrapped in plastic and labeled. 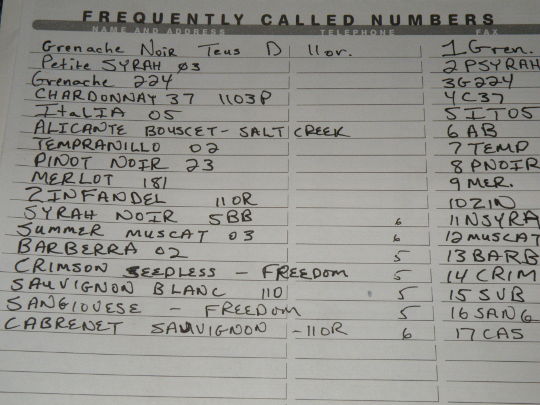 The moisture helped the vines in their cross country transit, and the labeling is invaluable as unkown varieties would require painstaking identification before wine could be produced. As I unwrapped each bundle, I made an index of variants and the codes I would use to indentify them with. It would be far too time consuming to write the entire name and affix it to each cutting, so I gave each type a unique number as well as a short version of it’s name. The shortened name would be invaluable if I lost the index, and the unique number helps with planning. After three hours of work, I had all of the cuttings placed in potting soil and ready for water. 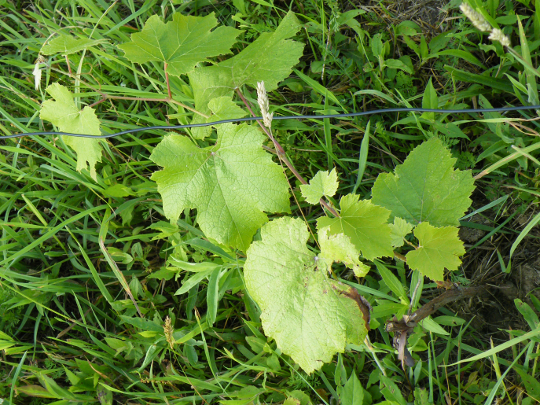 The vines need to be kept moist, and out of direct sunlight, and in a few weeks time, they will begin growing new green growth. At this point I’d love to turn the water a deep green color with the help of Miracle Gro plant food, but I want to encourage root growth, and Miracle Gro will bring out top growth. So where does root stock come into my plan ? Well, I’ve decided to continue the plan I’ve already got in place: Test varieties for their fitness in this enviroment, and allow the vines to grow quite a bit. In three to five years I should have more knowledge of the subject, and large vines from which to extract cuttings. At that point I’ll plan my vinyard. Yay! I can’t wait to help plant, pick and sip… What a great addition to the farm!